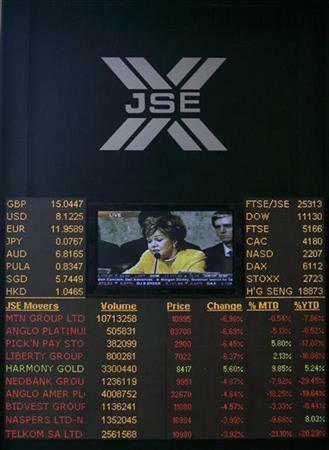 JOHANNESBURG (Reuters) - South African stocks fell for a third session in a row on Friday as platinum producers such as Impala Platinum and Anglo American Platinum skidded lower, with no end in sight to a strike at their operations. Shares of world No. 1 platinum producer Anglo Platinum fell 3.75 percent to 442.71 rand, coming off an almost 12-month high on Thursday, while Implats declined 3.8 percent to 115.44 rand. "The quicker we can get a resolution, not only in the platinum sector but the whole mining sector, the sooner we will see platinum miners regain lost territory," said Paul Chakaduka, a trader from Global Trader. Platinum's spot price was headed for a second straight weekly drop despite the strikes at South African mines that have hit about 40 percent of global output, with no end in sight with the two sides poles apart on the issue of wages. The rand reached new 5-year lows in the past week as money moved out of developing countries while the Reserve Bank raised interest rates by 50 basis points on Wednesday, a further hit to investor confidence in Africa's largest economy. Advancers slightly outnumbered decliners 159 to 151, with 254 million shares changing hands, according to preliminary bourse data.